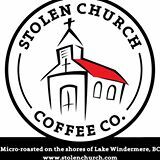 We are selling Stolen Church Coffee as a church fundraiser. Various roasts are available to sample and purchase. Please look for the new sign for St. Peter’s at Gerry’s Gelati explaining its history.